One of the most unique aspects of life at 5333 Connecticut Avenue is the rooftop access. On our rooftop, you’ll have access to a whole host of features and amenities not typically found in apartment complexes. The possibilities are endless and the experience can truly be life-changing. Take a Garden Stroll- Without Ever Leaving the City! 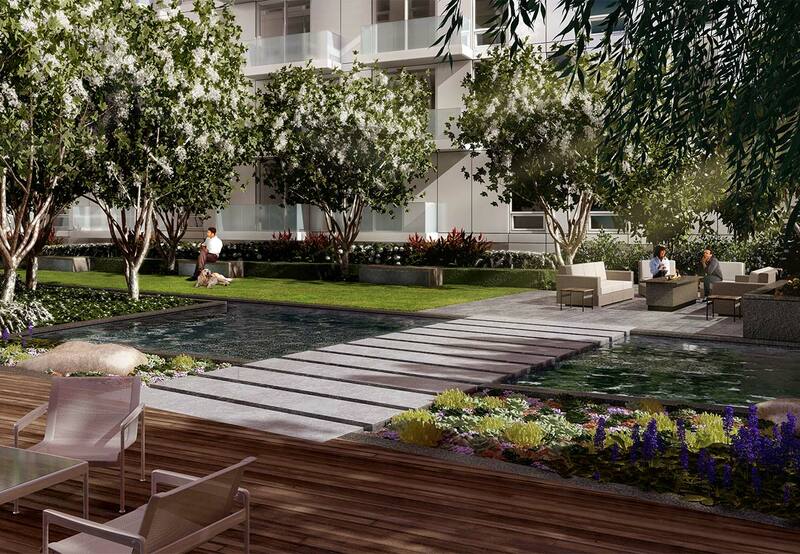 Your good times and memories start right at home—check out the landscaped rooftop courtyard amenities, complete with water features, an overhead trellis, and lovely planters. DC is known for its beautiful nature, hiking trails, and lush green life. But if you’re pressed for time or don’t feel like making a trip, you can experience some great scenery right at home, in the safety and comfort of your own place! As mentioned in a previous post, health and fitness is a top priority for many DC residents. One of the best forms of exercise (and relaxation) is swimming—it’s great for the joints, excellent for cardio, and requires minimal equipment. For some, the main challenge with swimming is finding a convenient pool. At 5333 Connecticut, convenience is built in! Take full advantage of our beautiful rooftop swimming pool, complete with infinity spillway, a lift for accessible entry, and adjacent pool deck. Now you can lounge out and take a dip at a moment’s notice—just take the elevator up! Ever feel like taking your pup for a walk, but don’t want to go out onto the busy street? Or feel like it’s too late to go out? Take your canine buddy upstairs for a nice rooftop walk, problem solved! At 5333 Connecticut Avenue, residents have full access to the rooftop dog-walking area, where they can let their furry friends stretch out, romp, and get some fresh air at any time they like. Safe, fun convenience for the whole gang! Everyone would agree that Chevy Chase, DC is absolutely gorgeous during the daytime. However, it gets even more magical when the sun sets and the stars start to shine. This is the perfect time to relax and unwind after a long day of hard work, or on a weekend after one of those grueling work weeks. What better way to enjoy the night sky than to gather round a cozy fire? Check out our state-of-the-art rooftop fire table with stone top. Pour yourself your favorite drink, and relax around the fire on some couches with your friends and loved ones. Play some light music on your portable speaker, or just enjoy the silent night air. Make the rooftop lounge area your prime destination for some fresh air after a hard workout in our onsite fitness and yoga center. Whatever your choice, it’s a great way to wrap up your day at 5333 Connecticut! Not many folks have the opportunity to view the DC skyline from a rooftop vantage point at a moment’s notice. Interested in living in Chevy Chase, DC, right in the heart of one of the city’s most picturesque districts? Contact us today at 5333 Connecticut to learn more about luxury living with an abundance of premium features and amenities.